Do Soccer Players Run Every Day? 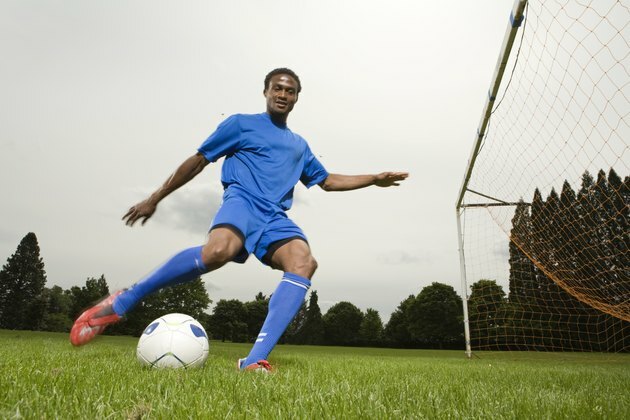 Soccer players cover five miles or more during a game, in motions that consist of sprints, jogs, strolls, backpedals, shuffles and walking, as well as forward, backward and laterally, according to video analysis of elite players in the United Kingdom. Championship soccer teams look closely at the best way to prepare players for the game. The simple answer to whether soccer players run every day is "no," though training patterns during the week include lots of running. University of North Carolina conditioning coach Greg Gatz cautions against slow, methodical jogging or distance running in preparation for soccer. This type of running does not transfer to the game "and can even diminish acceleration and explosiveness," he writes in "Complete Conditioning for Soccer." Running is better as an activity woven into various aspects of training, including light jogging to warm up and to cool down, running to enhance speed and agility and running during skill drills, scrimmages and conditioning training. Recovery is part of soccer training, so taking a day off to rest is actually a sacred part of serious soccer training. Gatz advises taking a recovery day the day after a match. You won't be running the day after a Saturday match, for example, or after Wednesday and Saturday matches if you play twice a week, he observes. A sample weekly training plan with one game a week begins with your rest and recovery day. Day two focuses on resistance training, and day five on resistance and power training. That leaves four days a week of running: sprints for conditioning on day three, work on acceleration and agility on day four and acceleration drills on day six. The week concludes with match day -- day seven. The goal is to have you as an athlete at peak conditioning on game day and not too fatigued by daily running. With a heavier schedule of two matches a week and thus two days of recovery, you'll likely have just two days left for acceleration and agility work and conditioning. Like Gatz, coach Debra LaPrath, author of "Coaching Girls' Soccer Successfully," believes it is best to enhance speed, endurance and agility via drills that involve running. Creating endurance in particular helps players to keep moving between sprints during games. She does recommend, based on a more benign view of distance running than Gatz, that you should run up to 30 minutes three times a week during the off-season. Another option is to cross-train to maintain endurance by swimming, cycling, stair climbing and running on a treadmill, she notes. How Many Calories Should a 150-Pound Woman Consume Daily?